Southern Delaware’s lingering drought received a brief respite on July 19th. At 2pm severe thunderstorms rolled into the Milford area, bringing heavy rainfall. This steady inundation brought much needed moisture to stressed plants. 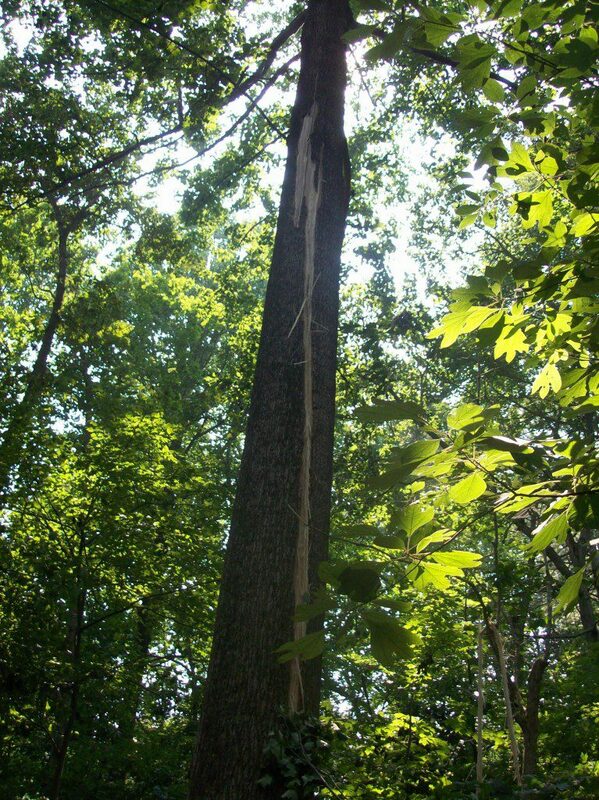 While the rain was a blessing for most plants, the storm’s associated lightning and wind had a dramatic effect on some of the Milford Millpond Nature Preserve’s trees. 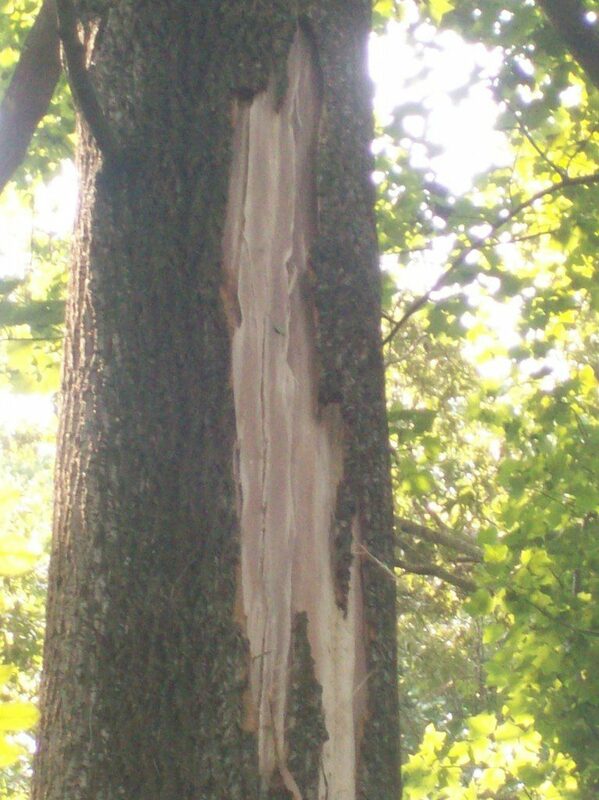 This Tulip Tree was struck by lightning during the July 19th storm. 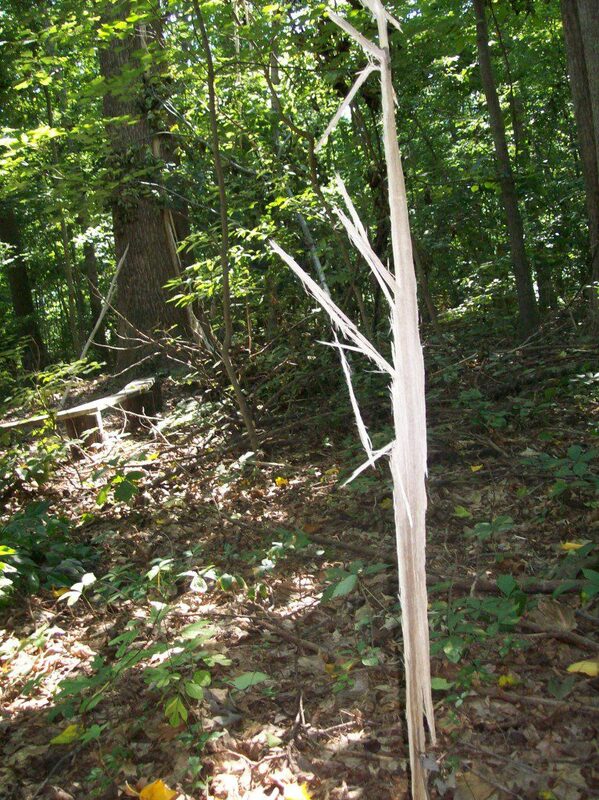 Abbott’s Mill naturalists prepping for a Native American program in the Lindale Tract encountered an abundance of tree debris and also discovered an impressive lightning strike on a large tulip tree (Liriodendron tulipfera), also known as yellow poplar. The trees appears to have survived, but it will bear the marks of the strike for the rest of its days. Path of the lightning through the tree. The long scar, which runs the length of this impressive tree, tells us about lightning attraction and how trees handle it. Tulip trees, being one of the tallest and fastest growing hardwood species in the eastern United States, have a high biomass. The combination of height and girth make these trees excellent conductors of lightning in the forest. However, sap is a poor conductor and in a lightning strike, is superheated, becoming steam. From this rapid expansion of liquid to a gas, an explosion occurs. The photo below shows fragments of bark and sapwood blown off of the tree, accounting for the exposed wood. 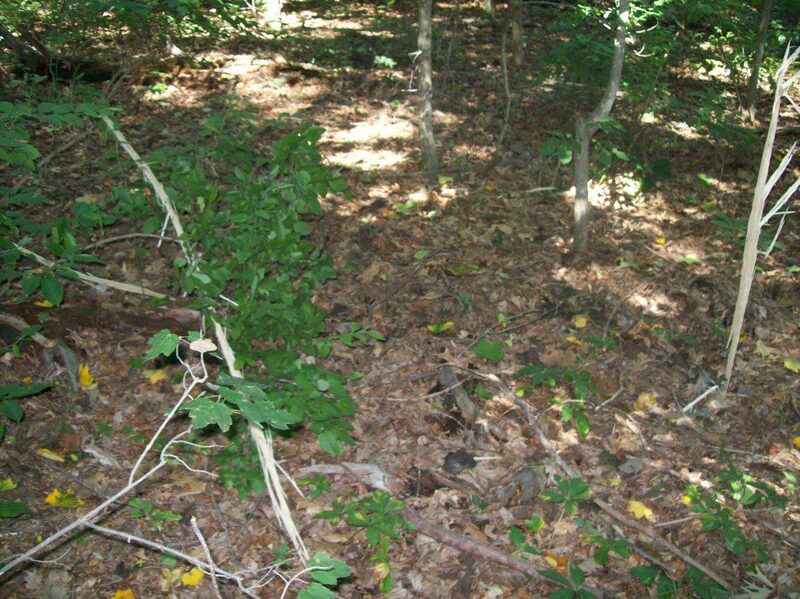 Shards of wood were found over 50′ from the tree and throughout the sub-canopy forest layer. Debris from the strike covers the surrounding area. The high visibility location of this tulip tree on the Lindale Loop Trail will serve as a teaching point for years to come. If you are interested in seeing the tree for yourself, stop by Abbott’s Mill Nature Center and pick up a trail map highlighting our miles of hiking trails. However, you might want to check out the chance of thunderstorms in the area before you venture afield! Shard of the tree spiked in the ground. If we could send a cool breeze through your computer screen this week, we would. Nature is adapting to the hot conditions outdoors at Ashland these days through a number of means. For instance, I took a quick walk by a small creek yesterday and spooked up a huge number of Gray Catbirds and American Robins that were bathing and taking advantage of the cooler micro-climate. If you see a bird in your yard on a hot day, take a look…it might be panting like a dog. Other animals like White-tailed Deer and Red Fox become very nocturnal. Birds like a Red-tailed Hawk might take a flight into high altitudes to cool off. Here are a few photos from a colder season to help you deal with the heat this week. I will still take summertime! Delaware Nature Society Teen Naturalists after a hike to The Pinnacle in the Pennsylvania Appalachian Mountains a few years back. 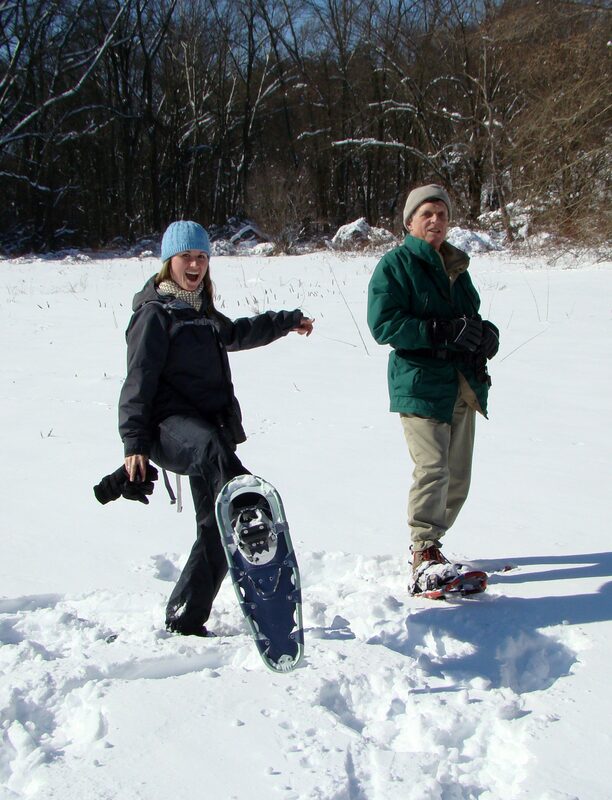 Remember the days when we had to snowshoe in order to take a hike at Ashland? 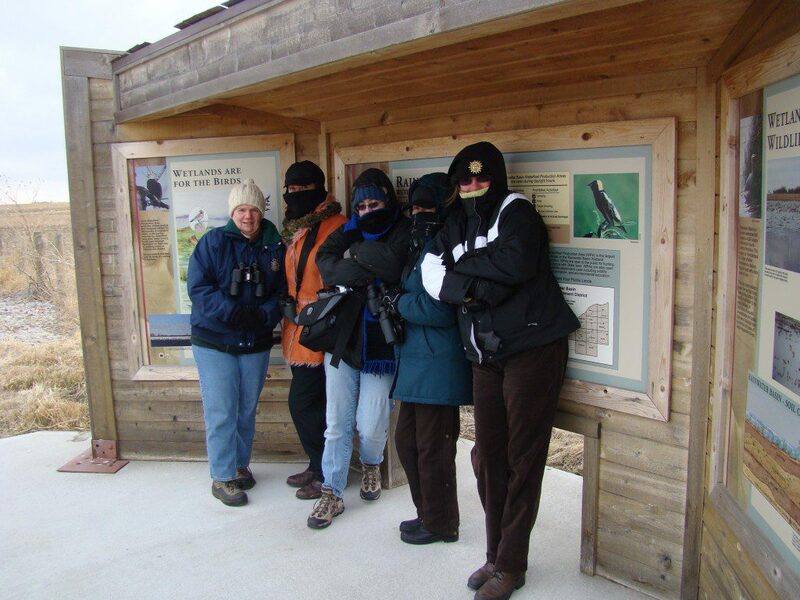 Maybe you are wishing you were freezing in Nebraska...like we did on our trip there in March, 2009. 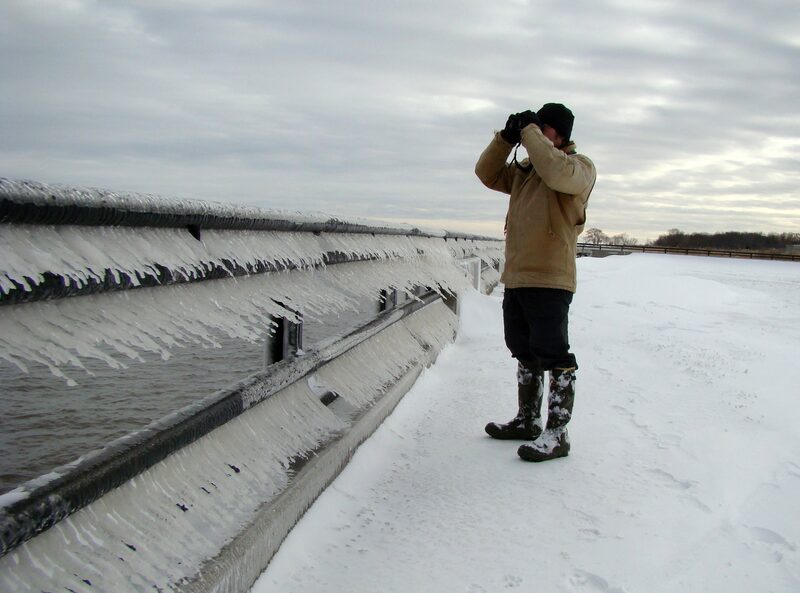 How about a December birding trip to the Delaware City Waterfront, complete with sideways icicles? 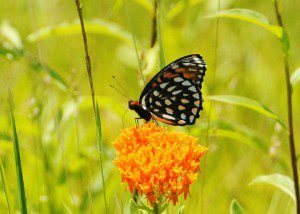 A Regal Fritillary sips nectar from a Butterflyweed at Fort Indiantown Gap. Image by Derek Stoner, July 1, 2011. 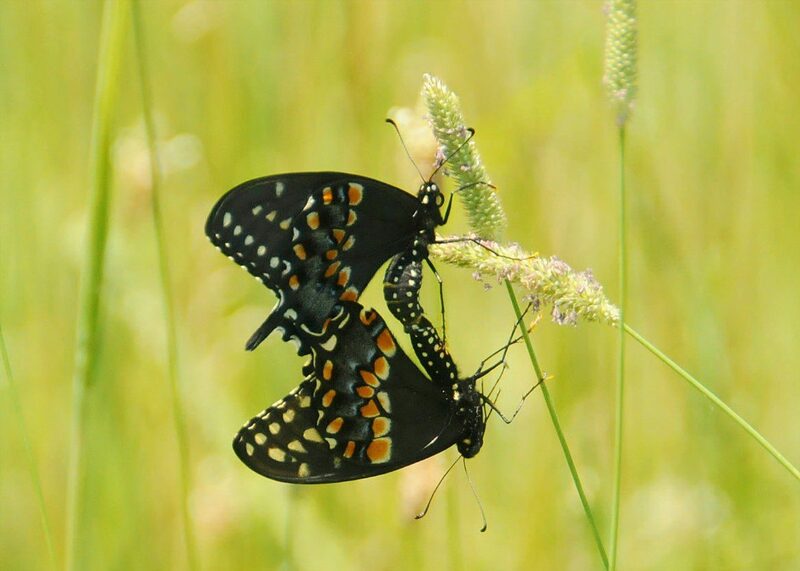 A pair of Black Swallowtails mating at Fort Indiantown Gap. Image by Derek Stoner, July 1, 2011. 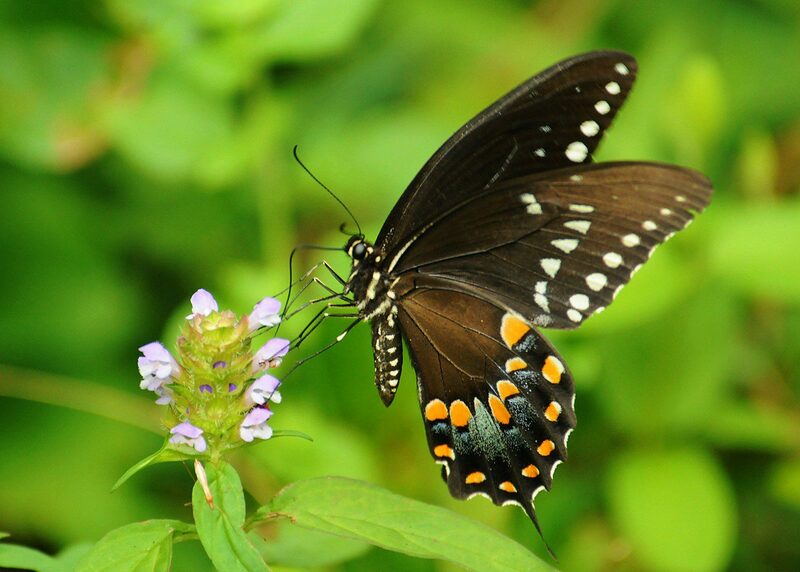 The middle of summer brings about peak conditions for butterflies: plenty of nectar sources for feeding adults and plenty of food sources (plant leaves) for feeding larva. 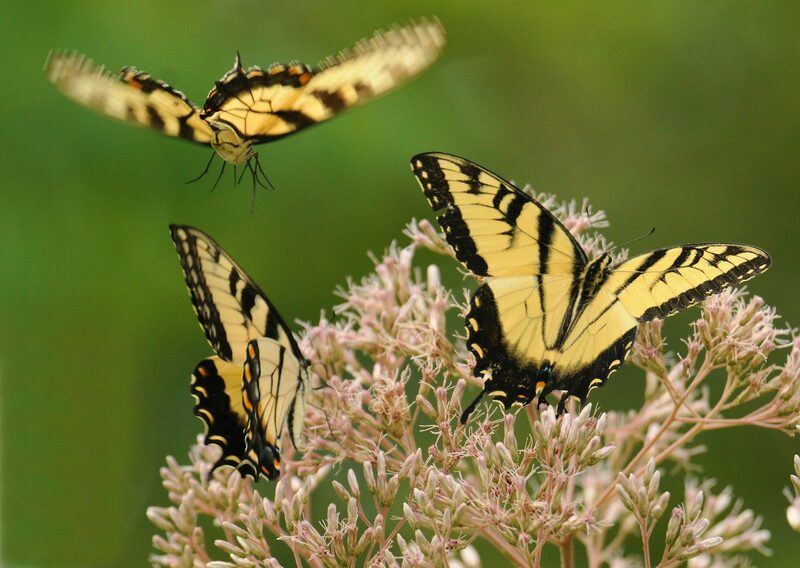 Adult butterflies have a very short lifespan (two to four weeks on average) and the summer season is full of butterfly mating activity as these insects seek to continue the next generation of their kind. On Saturday, July 30, the Delaware Nature Society will be taking part in the annual North America Butterfly Count . This count takes place in the month of July on a date selected by a regional compiler of this citizen science effort. The North Delaware count on July 30 will include two Delaware Nature Society properties: Ashland and Coverdale Farm Preserve. We often tally 25-30 species of butterflies during the day, and enjoy other great sights besides the beautiful butterflies. For the count at Ashland we will meet at 9:30am in the parking lot. To join us in the afternoon count at Coverdale, we will meet at the Ashland parking lot at 1:00pm. Please contact me if you plan to participate. Thanks!